Our urban home came with a huge old garage, a building that looks and is from a time passed long ago. I liked this building right away. While Anna loved the house, I saw lots of potential for this old building. We do not know how old this building is. While renovating it, I found an old battery from the 40s, so it is at least that old. One neighbor was telling me that back then the garage was being used for a carriage and later one of the owners parked his semi truck in there. It seems that it has not been in use as an actual garage for a long time. The most recent previous owner had a music stage in it and made music with his band quite regularly. The south-facing windows at the back wall were covered with sheets of plywood to keep the sunlight out. We are not so into music but more into food. Our goal is to have a year round food production place. 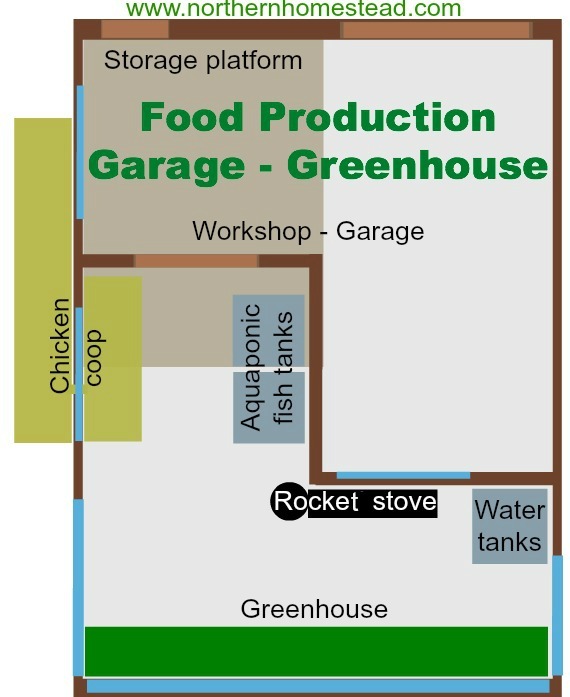 Raising chickens for eggs and fish for meat, also growing aquaponicly mainly greens also have a place to grow seedlings in the spring. 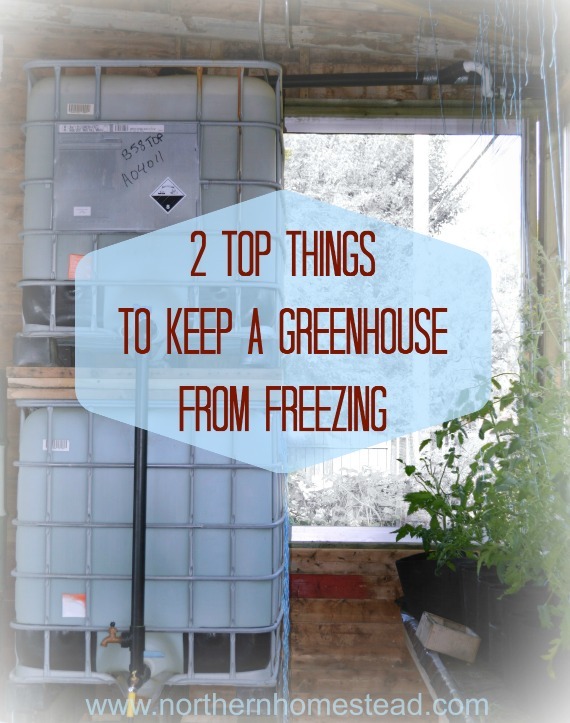 The food production garage is not a season extension greenhouse for summer crops. For that the GeoDome greenhouse is much better. 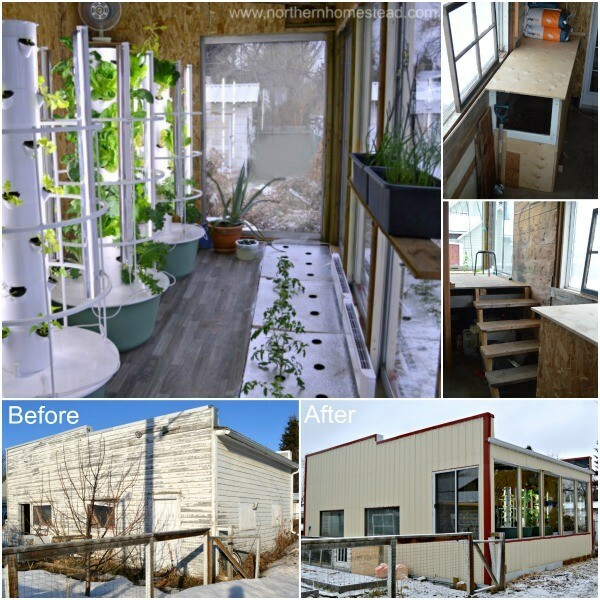 The plan is to have a growing place along the south-facing back wall, a chicken coop along the west wall with a run inside and outside, aquaponic fish tanks in the middle, and a shop/garage on the north side of the building. The building will be heated with a rocket stove using two 1000 liter water tanks as thermal mass. 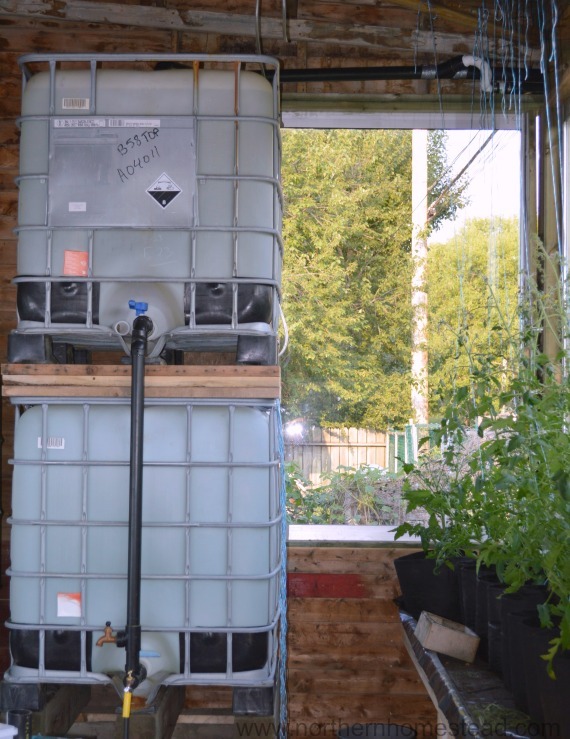 The water tanks also serve as water collectors from the metal roof and a watering source for plants in the summer. We started working from inside, then opened the south wall. 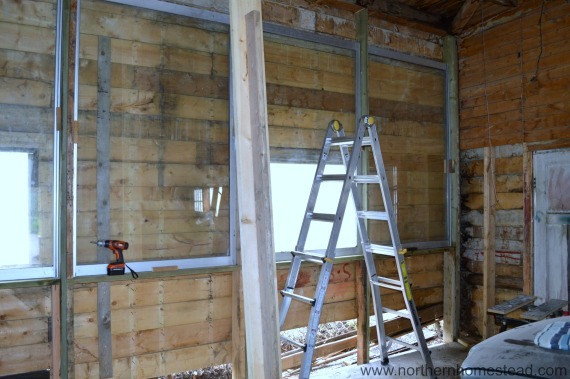 In this process we completely replaced the south wall, including the framing. We installed 5 double panel, sealed recycled windows into the south-facing wall. Lots of sunshine came in. Also a window on the east and a double slide door on the west added light. Since we are at 51 latitude, and our sun basically never comes from above, we decided to keep the roof as it is – it just insulates better. 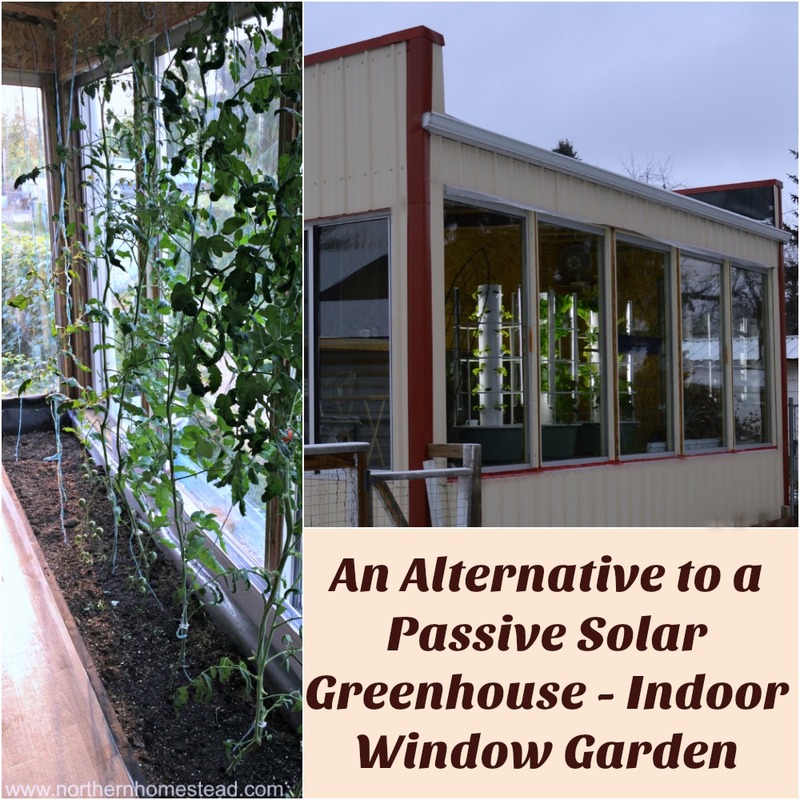 Having windows just on walls will keep the place warmer in the winter and cooler in the summer, just what we need for our goal. 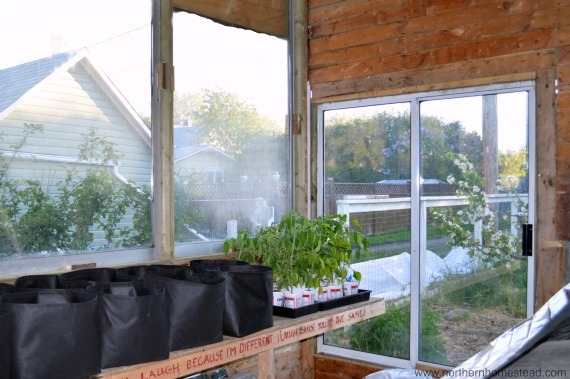 Then almost right away we built a bench along the south wall and started our greenhouse experiment in some grow bags. In the future this will be the place for the aquaponic grow beds. Next on the building project was the chicken coop. We built a chicken run along the wall outside and an opening in the wall into the garage/greenhouse. A temporary structure serves them for now. Insulation and heating urgently need to be done. The water collection system is also in place. There is a run in from the roof and an overflow back to the outside. Working now on the rocket stove to heat up the water and keep the greenhouse above freezing. Not an easy task in zone 3. As you see, we are busy and thankful for all we could do this summer. We will keep you posted on the progress as God provides strength and health. 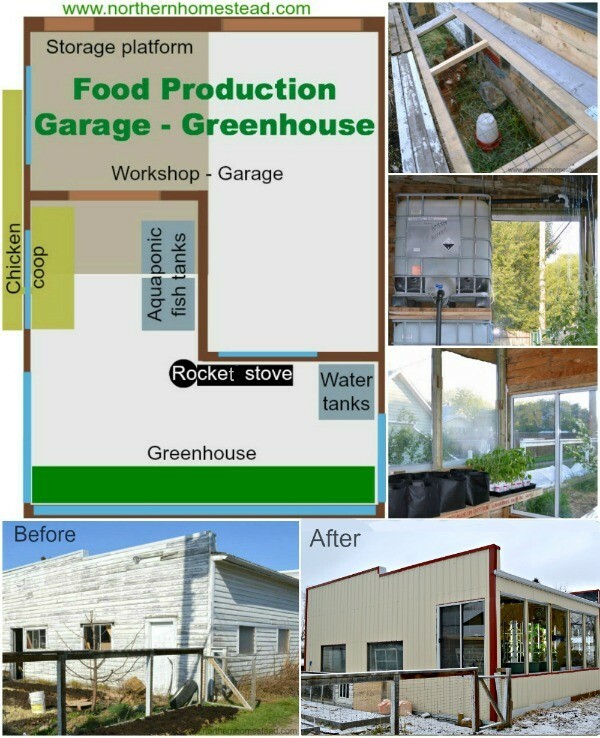 You might want to read an update on the food production garage – A Greenhouse for Winter Growing. We invite you to follow us on Facebook, or Pinterest and subscribe to Northern Homestead for the latest updates. I love that big, old building. Looks like you’ve got it all figured out as to how to use the space efficiently. 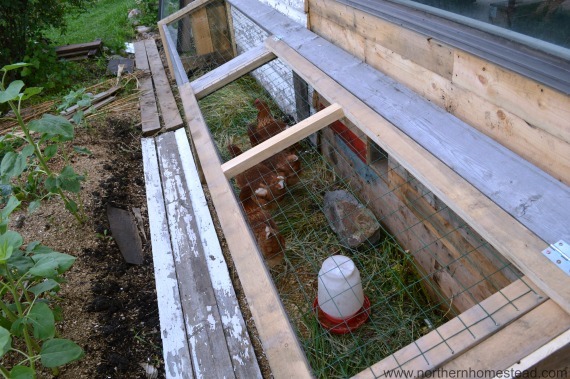 The chicken run is a great idea. Looking forward to watching the progress of all of your hard work. It is quite a building. With all the changes we want to preserve at least a bit of this old, character look. It sounds like a lot of work but I know you guys are up for the task. Looking forward to the final product! 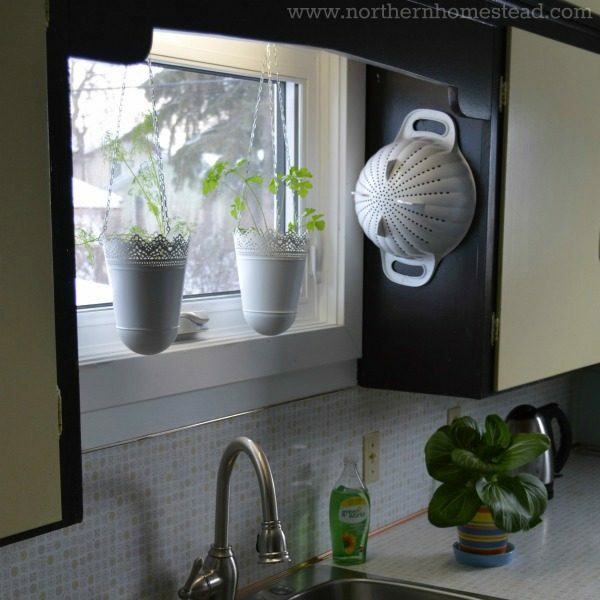 I have always been fascinated by aquaponic gardening. It’s one of my favorite things to see at Epcot. Your garage has a rich history, doesn’t it. What a nice building to own! Aquaponic is fascinating! Jakob gets really excited when he can work on projects like this ;). It looks like this old garage is a multi-tasking one. Carriage, trucks, music, and now animals??? I am glad you are finding a useful way to use it to provide food for your family!! I like old places with history. What an amazing space you have created with that garage! Ours is not nearly so big, so we could do nothing like that, but yours looks incredible! It is an interesting building for sure. It first I did not like it, but thankfully Jakob saw all the potential. 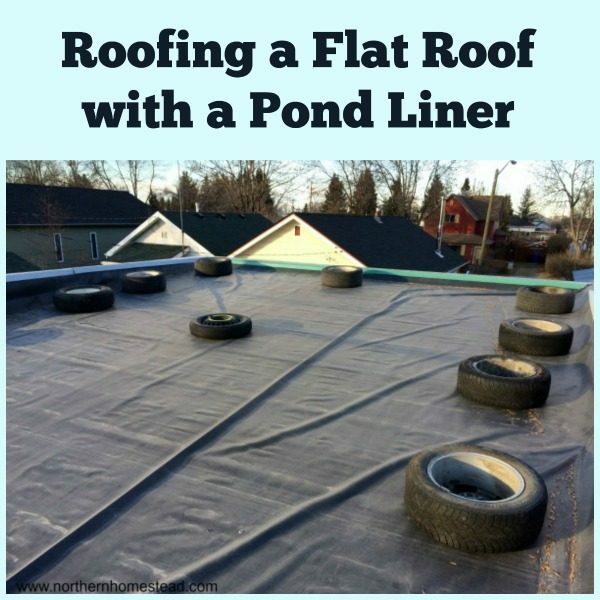 This is a real interesting idea. What a great way to include more freshness in our diet. Which is something all of us could use more of. We should could. 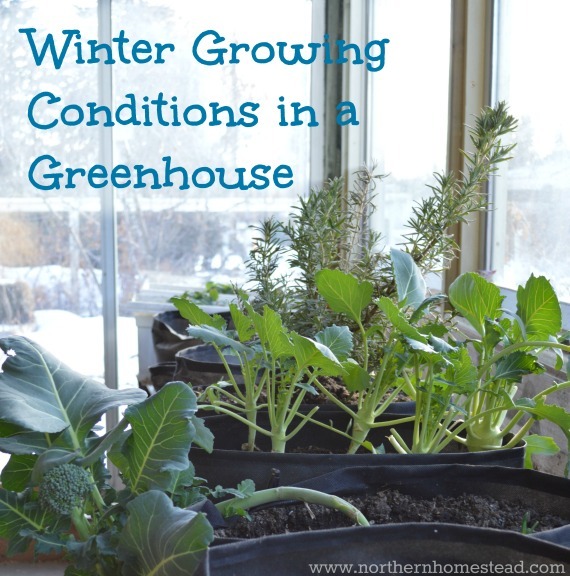 And with our long and cold winters, a greenhouse is almost the only way to get it homegrown. Woah…this is absolutely amazing! I love everything you’ve done so far, and all the ideas and plans you have for this space! I’m in awe right now. Oh, thank you Andrea! Jakob has so many ideas and loves doing it. And I love gardening, so we are a good team for this kind of things ;).